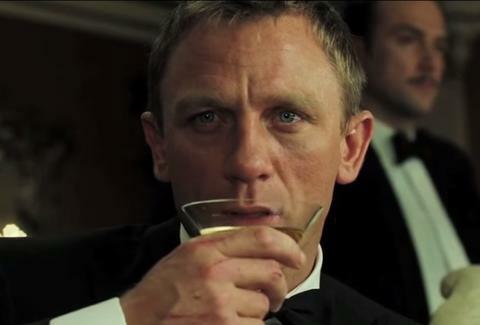 James Bond's fondness for alcohol is no secret. Scientists have determined he's a full-blown alcoholic, which is pretty obvious even if you've only seen one movie. But just how much does 007 consume over the course of the films? Reddit user anticafard posted an infographic that finally answers that question. Spoiler alert: it's a lot. Obviously. But it's not all "shaken, not stirred" martinis. Bond also frequently drinks whiskey, Champagne, white and red wine, sherry, brandy, mojitos, various shots, beer, and, in Tomorrow Never Dies, a half bottle of Smirnoff Red. Phew. He also notably does not drink any martinis in five films: Goldeneye, A View to Kill, The Man With the Golden Gun, For Your Eyes Only, and From Russia with Love. The spy drinks the most in Casino Royal (one glass of Mount Gay with soda, two glasses of whiskey, one glass of Champagne, two Vesper martinis, a shared bottle of red wine, two shared bottles of Champagne... and a half a glass of poisoned Vesper). And he drinks the least in License to Kill -- two glasses of Champagne and one vodka martini -- which was also Timothy Dalton's last turn as Bond. Coincidence? We think not. Check out the full infographic below. Oh, and don't turn this into a drinking game. You're no 007.